Celeste Boleware Towns was born on June 2, 1933 to Nora Boleware and McRoy Whatley in Alexander City, AL. She met James E. (Sonny) Towns at Laurel High School and they united in Holy Matrimony, of that union of over 64 years, nine children were born. Celeste accepted Christ at a very early age. 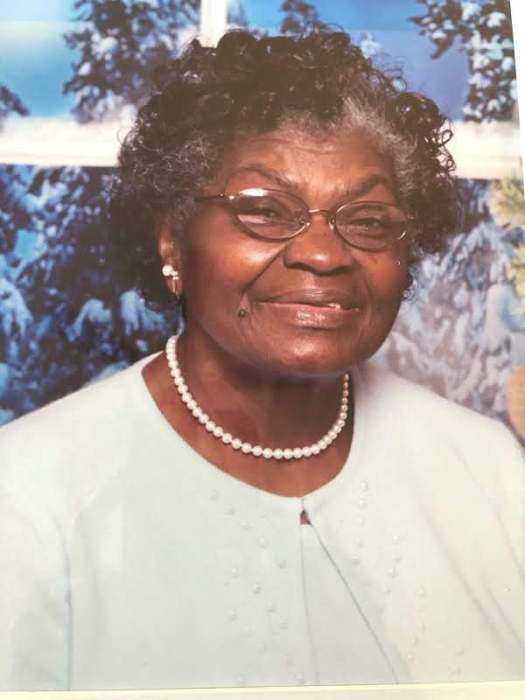 She joined and served at Early Rose Baptist Church for many years. She instilled in her children a faith in Christ and brought them all up at Early Rose. She later moved her membership to Church of God and encouraged her husband to join. Celeste retired from the Alex City School system as a cook for many years. In addition to other jobs, even as she raised eight children. Mrs. Celeste, as she was known in the neighborhood was a mother figure to many in her community. She was an excellent cook and baker and had a kind and loving spirit. She was known for her beautiful smile. Celeste was called to Glory on January 30, 2019 at Memorial Hospital in Chattanooga, Tennessee. She fought a long battle with Alzheimer’s, Diabetes and Kidney disease. She was preceded in death by her parents; husband, James and beloved brother, Jimmie H. Wilson; daughter Amanda Sue and son James Christopher. Pam (Samuel) Larry of Newnan GA; Broderick (Teresa) Towns of Alexander City, AL; Eric (Virginia) Towns of Alexander City, AL; Jennifer Towns of Notasulga, AL; Lawanda (Felton) Chinn of Chattanooga, TN; Roosevelt (Ivy) Towns of Fairburn, GA. And a brother James C. Whatley and sister, Marge Ree Nash of Summit, MS.
· Ten grandchildren: Jelani, Brodericka, LaRon, Celeste, Jazzlyn, Amanda, Rukiem, Maya, Zoe and India. · Special caregivers: Nancy Ellis, Katherine Shanahan, Tammy Dickens and April Jackson. · Special cousins Perry and Charles Moon and a host of nieces, nephews, cousins, relatives and friends. Mrs. Helen Brooks, special friend. Be not deceived, God is not mocked, for whatsoever a man soweth, that shall he also reap.